1. You are just out of college you don't have enough experience. WDK: An interesting time. But you know, you just live through those times and you don't find them too unusual because its gradual and it doesn't happen all at one time. …It was tough for you kids to go to college. But not nearly as tough as it was for your father’s generation to go to college. It meant nothing to a lot of people who later became lawyers and everything, to have two jobs and go to college full time. And they didn’t think anything of it. The economy played a big part in the War buildup and re-conversion to civilian production. America had a command economy during the war...True prosperity, high civilian employment, production and consumption did not occur until after the war. The government was bigger & more Powerful in 1940's than in 1932 and it was underwriting the prosperity [B03-N01] During the interview Jack emphatically states that no matter how much the New Deal was acclaimed [which Jack thought was due] there was no true recovery until the war and true prosperity only after the War. 45. AKK So they got you both ways. They didn't want to give you a low paying job because you had too much education for it. And they wouldn't give you a higher job because you didn't have enough experience? 47. JJK If you got a job you were lucky to get 12 dollars a week. And if you had something really to offer, you got 14 dollars a week. But the real tycoons were making 18 dollars a week but they were real geniuses. 48. AKK Those were coming out of college or they were just regular guys. AKK: When the people came back from the war, was there an initial fear of how they would be reintegrated? All these men coming back at one time? JJK: Well, there was a certain concern. But you had the GI Bill, whereby they -- I forget with the deal was -- they were given a certain amount of money for 52 weeks. I think it was $20 a week. 52 -- 20 and out. And that $20 was a lot of money in those days. Then a lot of the guys went on to college, which they wouldn't have been able to do. They went under the GI Bill. AKK: Was that the same bill -- covered both? JJK: I don't know if it was the same bill but the GI Bill was there. And they went on to college. And then the economy started picking up because there had been no action at all for years before the war and during the war. You had a shortage. Mobilization and Re-conversion tended to work in favor of -- [business] Giants. . The Government provided subsidies, low-cost loans & quick tax write-offs for business to invest in production facilities [B03-N02]. Jack and Wanda discuss the countries preparing for the War and the conversion of industry to post war civilian production. However at the time there does not seem to have been much discussion or awareness in their circles of what type of incentives or subsidies may have been offered to business to meet the production targets. The understanding seems to be that government subsidies were needed for gearing up for war production but not for re-conversion. WDK: During the war all industry and the manufacturing were (geared) towards war. The uniforms, the ammunition, the guns, the planes, the cars everything like that --. When that ended the economy continued good because now people needed cars at home. You know everything had to change over. But the manufacturers would just change what they were manufacturing. To peacetime. AKK: Was there incentive the government was giving the manufacturers to change what they were producing too? WDK: I don't think it was a necessity. No..
JJK: I don't think so. I think it was just a natural growth, you know. You come in with plastics. We didn't have plastics before. TV all of a sudden come in around 1947 or thereabouts. We had no TV before when we were kids. AKK: 0h maybe they were paid to transfer to armaments. Then the re-conversion wasn't as difficult to go back. WDK: Well there was -- don't forget there was also experiments going on, on everything during the war, on every different kind of thing. AKK: So that they could use that experience? And now there was an (super) demand. AKK: Because if all these guys were making $20 a week, they wanted to spend it. JJK: You had no cars during the war, being produced [for civilian use] during war, you know. No radios, nothing. AKK: Because the cars were all being like -- military jeeps? JJK: Sure, yeah. You could not get any tires. And all of a sudden the war is over, you want all of these things. That was it. WDK: You couldn't get gas. The same with food, it was rationed and all those things during the war. Wanda mentioned her displeasure with some controls which influenced the way a Canadian national working for a US company inside Canada was treateated. The payment of lesser wages to national workers seemed inherently unfair since it appears to contradict the philosophy of "equal pay for equal work". AAK: And wasn't there some situation there or maybe another place worked, where you would take a lot of guff from somebody and finely you stood up to him? WDK: Oh, that was in the office in Whitehorse. Remember they were holding my salary. Leo Taylor was the U.S.E.D. [United States Engineering Department?] and they weren't giving me the salary I was promised. And he was very officious. And so I got on my high horse and both the file office and the bookkeeping office and the payroll office, because we're all in one room, could hear me. Because my voice carried. And I told him what I thought of him. And I do not remember exactly what I said but I was very firm. It didn't do too much good. I never did get my back pay the whole year I was up there. They owed me about three or 400 dollars when I left. I had heard this family story of injustice on a number of occasions. But now having been with the international civil service for over two decades I understand better why many countries have a policy of paying their national workers stationed out side the country more than they pay locally recruited staff. This is part of the incentive to encourage nationals to accept the discomfort of leaving their own country. War Loan bond drives took in $135 billion. 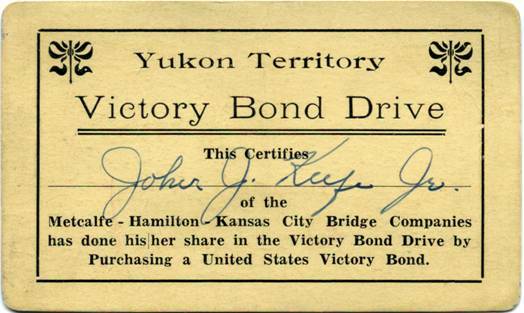 Individuals bought about 1/4 of war bonds [B03-N08]. During the interviews Wanda mentioned in passing that she handled the administrative portion of tracking the war bonds sold to employees of the firm. There did not seem to be much need for discussing what the bonds were since they were so ever present during those years. It is however a cute story concerning offers of help from colleagues in administering the bonds and Wanda seeing a side of Jack's "take charge" personality. She was a bet shocked or embarrassed in this instance. WDK: I think it was that night I was doing the work on the bonds, because we sold bonds as well. AKK: To the workers? So they can save money? AKK: Where you shocked when he did that? Jeffries notes that in order to attract or retrain workers during the war time labor shortage, businesses often found ways to offer incentives outside the usual means of pay and remuneration which were strictly controlled. Usually the War Labor Board? [NWLB] allowed hidden compensation as holiday pay, pensions, health insurance or supplemental unemployment compensation. [B03-N09]. Wanda notes for instance, that the female staff were well treated and this may in part have been due to fact it was difficult to attract and retain good staff to perform this type of work in the Yukon. AKK: So both Canadians and Americans were on this staff? JJK: Oh yeah, they lived in the same barracks. They had the Canadians and Americans in the same barracks. And a woman's barracks was about 100 yards from the men's barracks. You had the men's barracks, the woman's barracks, the office and a mess Hall. AKK: What about the showers? They were all separate weren't they? WDK: Not in the woman's. JJK: The woman had their own showers. But then men, the showers was about quarter of a mile from there, where we used to go. WDK: And you had the washing machines down there that you could do your clothes and everything too. And we had ours right in our headquarters room. AKK: Were you guys all in one room or you had separate rooms for the woman too. JJK: You had four in the woman's? JJK: I only knew two, Nancy Ferrymen and Helen Ashland and they had two. WDK: Right, but there were a couple of more, yes. I was one of the first girls to go up there, one of the first six. So they very kindly gave me a choice. First they kept me in the hotel down in Whitehorse and they picked me up everyday and brought me to the office and back at night. Then they got the Quonset hut set up as headquarters. They had single rooms at the front side was the community room where the big stove was, to keep the fire going and everything warm. There were two single rooms on each side going down the hallway and I picked the first one. And that's the one I had the whole time, so I had my privacy and my own room. JJK: In the men's barracks you just had a bed, period. AKK: Everybody was in the same? JJK: Everybody. Yeah, 40 guys. JJK: No, just 40 beds. And you had it heated with a round bellied stove. You had three round bellied stoves: One at this end, one in the middle, and one at that end. The bull cook used to come through all during the night and throw wood on it to keep it warm. And the son of a gun, he would get drunk every now and then and he would not show up (chuckle) . When you get up in the morning it would be freezing! At the other end of the barracks where I had my bed you also had hot water. The water was in a big can and they heated it. You would go up there, get a little water and shave. And the John was about 50 yards away from there. If you had to get out in the middle of the night, you had to walk about 50 yards through the cold and the ice to get there. AKK: Was that the same with the woman's thing? Or they had the John inside, indoor plumbing or latrine? JJK: Oh, they lived high on the hog. They had it right in there. WDK: We were treated very nicely. Jack and Wanda were in agreement concerning the importance of good food and skilled cooks or bakers. JJK: And the food, the food was just great. After being in South America for two years, the tropics, the food there was not in the same category with the food up in the Yukon. It was really great food and also you had wonderful Baker's so it was good. The thing that amazes me, we used to go down the highway every week to pay off. It was a distance of roughly 200 miles from camp MaCrae where we were to Watson Lake. And every 25 miles or so they had what they call repeater station. And that repeater station they had about a sergeant and 10 men. Now they'd all get the same food and yet some of those repeater stations you would never go back there to eat with them again because the food and the coffee was so lousy. But, the other place which got the same food and they have good cook that made sure the guys were treated right. You made sure you ate at their place when we went down the highway. WDK: It made all the difference in the world having a good bull cook and a good baker. AKK: Because those are one of the few things you had to look forward to? Was a good meal and people would relax, sort of like the merchant ship? Jack and Wanda like many others did not have firm plans as to where they would settle after the war. They originally thought they would be raising a family western Canada. 13. Plan to Go back to Alaska, children? WDK: Now you can understand why I agreed to marry him and come down on our honeymoon if we would go back to Alaska. AKK: You wanted to get the good food? WDK: Yeah, (chuckle). And I wanted to stay up there. AKK: And you didn't have any intention of having children right away? WDK: What ever God sent. AKK: Right. But you hadn't thought it through? WDK: No, no. No, we were supposed to go back. We were all ready to go back to Alaska. As mentioned in Paragraph B-02, even people stationed in remote places found ways to entertain themselves. The environment where Jack and Wanda were stationed demanded extra precautions during the long winter. Jack discovered this through experience. WDK: A Couple of my friends and I found this cabin that had been -- it was a trappers cabin and it had been abandoned. Because you know, when you leave there, you didn't take things with you. There really was no way to take it out of there. It was a not worthwhile. So it had tables and benches and chairs in it and a stove and all that. But it hadn't been lived in for a longtime. So we got equipment and cleaned it all up. We used to go down there and cook meals. A whole bunch of us would go just for the evening. We get stuff from the commissary. JJK: It was two miles from our camp. We used to walk. WDK: And we would walk down and have a big meal and sit around and talk and everything. Just enjoyed ourselves. Was it the first night you went down that you fell in the water? JJK: No, no it was after a couple of weeks. AKK: But, then you knew what you were getting into? You just didn't realize how cold it would be, or the snow? WDK: He was dressed by then for everything. But, we were going down this one night and everybody helped each other across. There were some streams that the water wasn't frozen all the way through. The water was off the river, it was like a slow brook off the river and it never froze that winter the whole way. It was moving so swiftly I guess. AKK: So, so across the top there would be ice? WDK: Right, there would be ice and everything. JJK: But, it would be very thin. JJK: I'll just go right over, you know. What I overlooked was the fact that the branches were going to break. (Laughter) Then I 'm in midstream and all of a sudden it breaks and Boom! WDK: We still had a ways to walk before we were going to get there. JJK: We had about a quarter of a Mile to get to the cabin. WDK: So he took his socks off and his shoes. And he put the, it wasn't the brace leg. It wasn't the leg you had the brace on. JJK: No. It was my left leg. WDK: And he put everything up by the fire. Then he's talking and telling his jokes and everybody is --. Then all of a sudden, we go (sniff), something’s burning. AKK: And it was your shoes? AKK: 0h no! So you had no socks than either. Did you get them out of the fire? JJK: I must admit, on the way back I was very concerned, because it was about a mile and 3/4 to go and it was -- cold. And I'm remembering all the stories they tell in the barracks. Where you would sit around and they would tell stories about guys freezing to death. Or losing their feet or their hands and I'm 0h,ohhhhhoo. The Serviceman's Readjustment Act of 1944 [GI Bill] was the transforming impetus for many people who served during WWII. Jeffries notes that by providing educational benefits and low interest loans for home ownership, business, and farming, the GI Bill underwrote both prosperity and upward mobility in the postwar era. The returning GI's were given keys to individuality and middle class status by a grateful nation. . [B03-N010] Schlesinger observes that students were probably never more serious, intelligent and self reliant than in those years after the war. Many of the post war students attendance was made possible by the GI Bill. [B03-N11] 1/5 of new homes from mid 1940's to mid 60's were financed by the GI Bill. As noted elsewhere, Jack and Wanda's work during wartime had supported the war effort. Jack had served in a number of overseas posts and in Canada. Since there work was for contractors and not directly for the Government, they were not eligible to receive GI benefits directly, However they were able to get a first home mortgage because a friend who had served overseas was able to assist them by drawing on his GI benefits. WDK: [During the war] You couldn't get gas. The same with food was rationed and all those things during the war. AKK: When you were going to move from Freeport to Seaford did it seem like things were really opening up? That you are going to get your own place out on Long Island or -- Was that a common experience after the war? People would get a job and then -- it looked like it was growing? People were feeling secure? WDK: Well there was also the GI Bill. Where you could take a loan out when we were buying a home. You could get -- the GI Bill gave money to people who bought their own home. It became as cheap to buy a home as it was to rent. JJK: That's when/how Levittown was built. WDK: So, Levittown. You've probably heard the story of Levittown. There it tells it all -- what went on all over the country. And even in Canada, the same. AKK: So, because they had that money, they saw if they would take out a mortgage and put their $15 a week into a mortgage or less it was the same as what they were paying for rent. WDK: Right. The dream was you wanted to own your own home. An interesting time. But you know, you just live through those times and you don't find them too unusual because its gradual and it doesn't happen all at one time. AKK: And it is happening to everyone else around you. WDK: Exactly, exactly. And the jobs were really pretty plentiful right after the war. AKK: Must have been, especially compared to everybody’s experience right before the war.